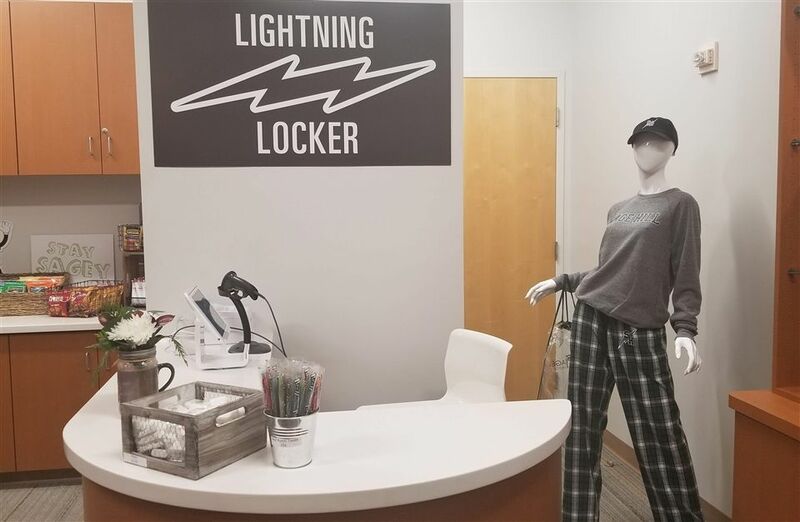 Sage Hill’s new school store, the Lightning Locker, will officially open on Tuesday, December 11. The on-campus store will make it easier and more convenient for students and families to purchase Sage Hill branded merchandise. Previously, these items were only available to purchase online or at certain school events. The store is tentatively set to be open from 11:00 AM to 4:00 PM, Monday through Friday. “We want everyone to be able to show their school spirit by wearing logo items, which can only happen if we make it easy to buy them,” Head of School Patricia Merz said. In addition to the store, located in the Lipman Family Lobby in the upper gym, Sage Hill will also be rolling out an enhanced spirit wear website for alumni, relatives and others who cannot come to campus to purchase Sage Hill items. School administrators have worked hard to make sure that the merchandise is available at a wide variety of price points so the Lightning Locker will have something for everyone, regardless of their budget, Merz said. Most of the store’s merchandise will be sourced by local company The ReconGrp, which is an expert in management and design of branded merchandise. Some of their other clients include Go Pro, Audi and Nike. Students are also getting involved behind the scenes with the Lightning Locker. The new Spirit Wear Club has been meeting with school administrators and will continue to do so regularly.